With so much focus on the financial economy, it is easy to forget there is a diversity of economies, trade and exchange relationships operating in our communities. The visible part of the iceberg (from Community Economics) represents the capitalist market-based economy, but there is so much of the iceberg we cannot see; so many other relationships and exchanges happening. Reciprocity is the practice of exchanging things with others for mutual benefit. In cultural anthropology, reciprocity refers to the non-market exchange of goods or labour ranging from direct barter (immediate exchange) to forms of gift exchange where a return is eventually expected (delayed exchange) as in the exchange of birthday gifts. Pay It Forward is an economy/interaction where if one is the recipient of a good or service, instead of ‘returning the favour’, a good or service is repaid to someone else. There are many ways to get involved in local, national and international Pay If Forward initiatives. Timebanking is similar to Pay It Forward economics in that you receive a good or service from someone without the exchange of money, but you do not necessarily return the exchange with them. Timebanking is an example of a complementary currency, where the currency is time instead of money. Another example of complementary currency is a local currency, which is currency that can be spent in a particular geographical locality or at participating organisations. A local currency acts as a complementary currency to a national currency, rather than replacing it, and aims to encourage spending within a local community, especially with locally owned businesses. There are a growing number of local currencies. Some that are receiving a lot of attention for their success are the Brixton Pound and the Totnes Pound, though there are many, many more. Also known as shareconomy,collaborative economy, or peer economy, a common academic definition of the term refers to a hybrid market model (in between renting and gift giving) of peer-to-peer exchange. Collaborative consumption is an arrangement where participants share access to products or services, rather than having individual ownership. Cooperatives are enterprises owned and governed by people that have voluntarily united to meet their needs and aspirations. CO-OP offers useful information to understanding what cooperatives are and how they work. As well as incorporating alternative economies into our current system (and recognising where they are already incorporated), there are also ways that we can improve on the business-as-usual approach: even if we want to operate in the capitalist, conventional system, we can improve on it by embedding our values in the way we do business. Some examples of how we can do this are by being committed to the welfare of the people we work with (e.g. by paying a Living Wage or ensuring Fair Trade standards are upheld), the communities we work in, and the local and global environment. Social Enterprises are an emerging type of business that work towards social value (like traditional charities) and financial value (like traditional businesses): they are the place where not-for-profit meets for-profit to for not-just-for-profit organisations. Capitalism is an economic system based on private ownership of the means of production and their operation for profits. Some of the key characteristics of capitalism include the accumulation of wealth and capital, wage labour, a price system, and competitive markets. It is the economic system that has come to dominate Western countries. The idea of a free market has become almost inextricably interwoven into the ideals of the capitalist economic system. 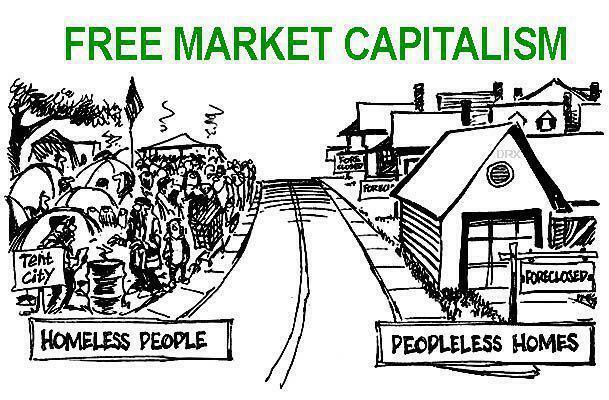 A free market is an idealised system in which the prices for goods and services are determined by the open market and consumers. The desire is that the forces of supply and demand are free from any intervention by a government, price-setting monopoly, or other authority. However, unfortunately without some universal values towards the environment and human welfare, it has become clear that free market economics can become abusive to people and planet. Neoliberalism is the political ideology associated with free market capitalism. It calls for a laissez faire approach to the economy (i.e. let it do its own thing without regulation) that celebrates markets, profits, and risk-taking. Many (particularly but not exclusively the political left) argue that some or all of these concepts are resulting in widening inequality between rich and poor, and are fueling practices that lead to environmental destruction; as their largely unregulated practices mean profits are internalised, but negative environmental and social consequences are externalised and considered beyond their scope of responsibility. Put simply, if you focus on growth, competition and profit maximisation, you place value on them. Market capitalism and neoliberalism put these things in front of everything else, including the welfare of people and the planet. Why neoliberalism, capitalism and the free market clash with environmental and social ethics is because if you are in a closed system (like, say, a planet), because there are a fixed number of resources within the system, anything you gain is at the expense of someone else. Many people, across the political spectrum, note that in all of history there has been an unequal distribution of power and wealth. However, that does not mean it must or will always be that way: power and wealth is a socially-constructed, man-made feature of our species. And it can be changed. The videoclip below offers an easy-to-follow description of economic growth and GDP. Most countries use GDP as the only or most important indicator of success. There is no denying, GDP is a good indicator of economic activity. However, it is NOT a good measure of progress and well-being, of non-market items (e.g. volunteering). Also, it values all dollars equally, regardless of societal consequences; a dollar spent on health is valued the same as a dollar spent on weapons production. Ironically, the developer of the GDP, Simon Kuznets, warned not to use GDP as a measure of welfare or as a sole measure of success – but that is exactly what most countries have done. 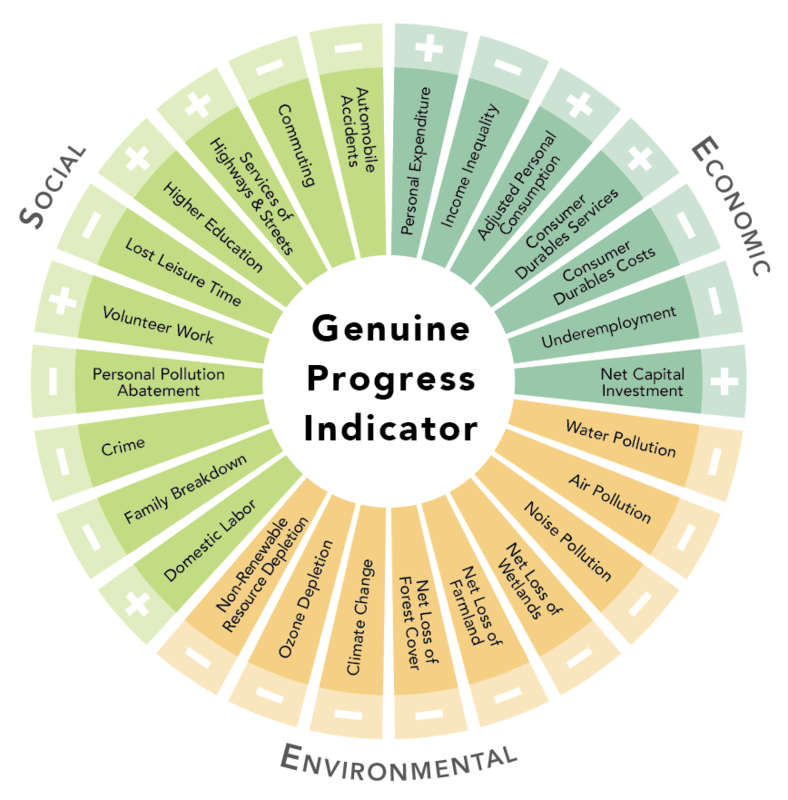 Unlike GDP, the Genuine Progress Indicator incorporates aspects of the non-market economy, separates welfare-enhancing benefits from welfare-detracting costs, corrects for the unequal distribution of income, and distinguishes between sustainable and unsustainable forms of consumption. The GPI is still based on economic activity, but it is more inclusive than the GDP. There is a strong case for measuring progress with indicators beyond just economic growth, and there are many examples that have been developed, including some which are used around the world, today. Urban areas are not only the living areas of humans, but flora and fauna, as well. Urban design is not just about designing for humans, but for all species. For us, green spaces provide areas for recreation, physical and spiritual well-being, mental health, and more. For other species, they can provide food, safety, and temporary or permanent shelter. The Fairfield Project is an amazing project taking place in one of Hamilton’s suburbs. With a population that is youthful, ethnically diverse, and sometimes financially constrained, the Fairfield and Enderley communities decided that there needed to be a local area that encouraged people -especially young people- to be out in nature and involved in their neighbourhood. And so The Fairfield Project came about. Situated behind Fairfield college was a large, under-used grass paddock, bordered by a neglected gully filled with some native plants and all the invasive weed species one could think of. In an effort to stop it being sold to private developers who would build houses on it, the community came together to transform the area into a hub of learning, ecological restoration, and community capacity building. Now, work has begun to restore the gully, and replant some of the grassy areas so it can return to native bush. An organic community garden has also been established in the north east corner; with 6-8 small allotment plots, and a large kumara area maintained by the local Tongan community. There are plans to develop a living classroom, a plant nursery, an edible orchard, a rongoā garden, and more. School and other education groups visit, care for and learn in the space, and it is hoped that as the project continues, more an more community groups will use and enjoy the space. Lynette Rogers, co-ordinator of The Fairfield Project, says the decision-making is always a participatory process and council is sought from mana whenua and local kaumātua. Today, over half the world’s population live in urban areas. By 2050, it may be as high as 80%. Despite cities only occupying approximately 2% of the world’s land surface, they account for approximately 70% of global CO2 emissions, and this is only going to increase in the future. In addition, spaces are designed for economic growth, rather than people: parks, playgrounds, community centres and dwellings are pushed out of the centre – to make space for businesses and parking lots. So how can we ensure cities and city developments keep people at their heart? And how can we make sure we look after the earth, and the other fauna and flora we share urban spaces with? Until recently, many urban designers were not aware that the way a city is designed determines how people behave, interact, and enjoy it. Foster interconnectedness: there are many opportunities for people to meet and interact. Cul-de-sacs are great for dwellings as they do not have any through traffic, and are often relatively safe. 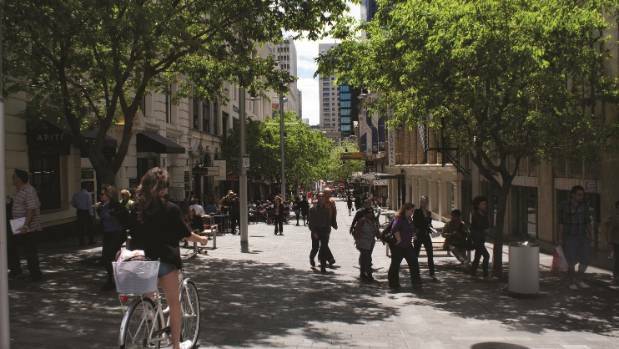 Pedestrianisation of areas has also been found to radically change how people use a space; with more pedestianised areas resulting in more people coming out, walking, and socialising. Foster well-being: there are opportunities to connect to nature, education centres, community services, and these are accessible to all. Working within the bioregion: ideally, urban and rural settlements within a bioregion will be self-sufficient, or almost. Bioregional self-sufficiency means the area will be more environmentally sustainable (for example it may have lower emissions, as less needs to be imported), it will have a vibrant local economy (as people will be supporting their local initiatives and businesses), and there will be a stronger identity (as each bioregion develops to suit its local area). Make the most of available resources: good design turns ‘waste’ into resources, utilises horizontal and vertical space, and means features have more than one use (e.g. a living wall can produce food, help purify air, and provide insulation to buildings). Even space itself can be a resource; if buildings are arranged randomly, a lot of ‘lost space’ can exist, but with some care, space that can be used positively is found. After the industrial revolution, many cities became progressively less liveable; congestion, pollution, and unreliable supplies of resources meant many people suffered or lived in poor conditions. There have been many ideas and movements to try and find solutions. Some have been somewhat successful, and others have resulted in additional challenges. One thing that has been discovered, is that there is no one-size-fits-all solution: to be effective, ideas need to be tailored to the local social, cultural, political and environmental circumstances. Though he and many others have attempted to solve city problems, those that forget to put people at the heart of design may find their ideas less successful. For example, many past and present city planners like to zone the area they are working in. Zoning is the process of diving land into different zones and encouraging certain activities within each. While this may seem rational and make a place appear more organised, it is likely to be less practical for the people that live, work and play in the city. In mixed use spaces, everything is much closer and convenient. Zoning can be a result of a disconnect between urban design and the people that use the space. When New Zealand was colonised, traditional Māori settlements experienced extreme disruption and destruction. With traditional lifestyles threatened, many Māori migrated to growing cities and were made to live in culturally inappropriate houses. Fortunately, there is now a growing movement to bring back papakāinga. Jane Jacobs was a writer and activist who was greatly influential in urban studies, sociology, and economics. Her book The Death and Life of Great American Cities became one of the most influential American texts about the inner working and failings of cities, inspiring generations of urban planners and activists – Project for Public Spaces. For example, in many cities, 90% of road space is for cars and 10% for people. However, 90% of the street population is pedestrians. So, it is time to stop catering for cars and start catering for people. Ecosystem services are the services an ecosystem provides us for free, and include resources (e.g. raw materials), regulating services (e.g. air quality and pollution management), habitat services (e.g. maintenance of genetic diversity), and cultural services (e.g. tourism). A healthy, sustainable city values ecosystem services and encourages biodiversity. Urban areas are not only the living areas of humans, but fauna and flora as well.